Sometimes baking tests don't come out well, and not only is there disappointment, but I blame myself for not having foreseen the flaw in the recipe, whether it be too many eggs, too little flour, not enough salt, etc. When this happens, I say to myself, "You were cooking with magic," as if some celestial power could have saved my ill-conceived plan. So in that context, I will post Daniel Rose's Grandmother's Banana-Zuccini Bread recipe as an example. On the surface, this looks like a very ordinary quickbread recipe. There is no reason to think that I might get a sublime result, yet I feel compelled to try it (as I did with the crack brownies) because I really admired the New York Times writeup on Rose in 2008 (watch the video especially) and have heard that he has been very successful since at his Parisian restaurant, Spring. Feel free to try it at home, and let me know if you get a magical outcome! "For a long time, we passed this out to dinner guests ... to take home for breakfast," said Daniel Rose, chef of Spring restaurant in Paris. "It's an American classic, but perfectly unknown here," Rose said. 1. Heat oven to 350 degrees. Mash the bananas with a fork in a large bowl. Grate the zucchini; press between paper towels to dry. Add zucchini to the bananas; stir in the eggs, sugar and oils. Scrape vanilla bean seeds into the bowl; mix lightly. 2. Combine the flour, baking soda, baking powder and salt in a small bowl. Add the dry ingredients to the banana-zucchini mixture; mix briefly until just incorporated. Add the cider vinegar to the milk; stir the milk mixture into the batter. Fold in the walnuts. 3. Pour batter into a buttered and floured 9-by-5-inch loaf pan. Bake until a knife comes out clean, about 50 minutes; cool in pan on wire rack, 15 minutes. Store, wrapped, in refrigerator. The Scene: The YMCA parking lot behind the stand was taken over this week by the fifth annual Doughman relay, raising money for programs at the SEEDS community garden. (If you aren’t already in the know, watch the Doughman episode of Man v. Food from a few years ago.) The morning was sunny and hot, and all the local trucks were out in full force. So was much of Durham—at least those devoted enough to community gardening, athletics, gluttony, or some combination thereof—and we gained more exposure from the additional foot traffic. The Product: This week we brought out Spinach Leek and French Coconut Tartlets, along with our Pain au Levain. The tartlets seem to be catching on pretty quickly, and have outsold the bread for several weeks running. This week also saw the return of our Iced Chai, just in time for the warmer summer weather. The Crew: The smaller but dedicated crew came together to keep the stand going while AB was away. Extra thanks to Ali R. in the kitchen, RML at the stand, and RG on the bike delivery route. Making a Scene: Whoah. Saturday was a world-record day for us. We brought higher-ticket items (babka and challah), made more tartlets (nearly 160), and the weather was optimal. The entire marketplace was very, very busy. Ginger Honey Chess Tartlet. Photo by Weege. I can't stop posting pictures of Ruch's kimchi. This week's iteration was the spiciest yet and not for the faint of heart or palate. Our awesome customers: The Rodgers family & LP, RG & EC & SMG, SSS, Joel et al., Katie & Todd & Lucas, Jason & Jennifer, Leia, Phil, Adam S. & Heather C., Weege & Friedrich et al., Laurie & Jeff. 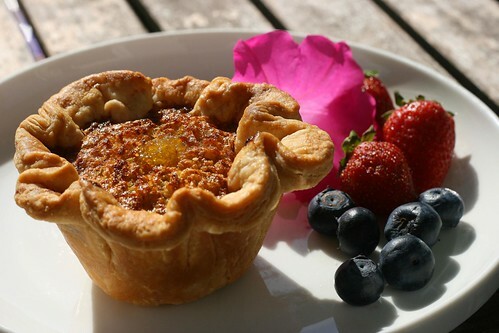 Wholesale: Joe van Gogh on Broad has picked up our tartlets for their cafe. If you missed them this weekend, a couple may still be there by the time you are reading this. 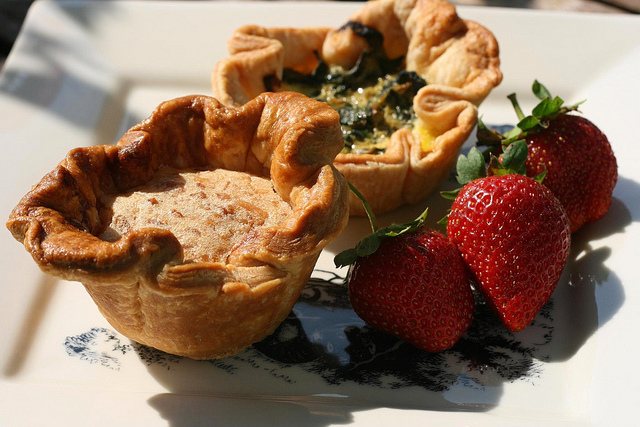 Our tartlets can also be found weekly at Respite Cafe and Reliable Cheese. The crew: Many thanks to our hardworking crew: Ali R., AR, and SZ. A busy market meant we were kept on our toes at the stand...thanks so much fellas for being so dependable! Loaf: I finally got to tour Ron Graff's Loaf operation. The amount of bread that he is able to produce from his one wood-fire oven is truly impressive. I don't think I've ever met personally a baker more dedicated to his craft than Ron. Also, big shouts to his crew/conspirators, Jamie and Anna. The product: We are learning that there is typically a greater demand for savory tarts early in the morning (i.e. breakfast). Later, the attractiveness of the peanut butter chocolate tartlets drew in a lot of customers ("What are those? Those are beautiful!"). The tarts looked so good even the venerable piemaker Phoebe Lawless checked us out for a microsecond on her way to the parking lot. Everything sold really well - 118 out of 120 tartlets sold or bartered, and all but one of the whole wheat breads. Many rave reviews as per usual of Ruch's Famous Kimchi -- AR, you are building quite a fan base! For a new customer who wanted to potentially make his own kimchi, we recommended Katz' Wild Fermentation, which is a useful introduction to pickling. Our awesome customers: EC & SMG, Leia, Joel+3, Marybeth and Allen, Adam S., Belinda, Adam R., Harris&Nat&Madeline, Keita, Walter&Ben&Linda, Jennifer+1, Brendon & Aiden & Sue + 2; Annie & Mike. The crew: Big up big up to RML, AR, Ali. R., and RG. You guys amaze me. Ali R., special big ups for decoding the mysteries of the pastry sheeter for our tartlet-making. The Weekend, Part Two: On Sunday, we went to the Bull City Food Exchange at Fullsteam, wherein local folks traded homemade food. We scored some Lemon Balm Jelly, Pickles, Strawberry Jam, Fudgy Graham Bars, and two plates of Mama Jean's BBQ. Big ups to Devin, Justine, Belinda, Carolyn, and others for putting this inspiring event together.